Reconstruction of Pompeii and Vesuvius on the 24th august 79 a.D.
Meeting with your private English-speaking guide by the entrance of Porta Marina Superiore. The archaelogical site can be easily reached either from Naples or from Sorrento ( approx. 30 Km from Naples or 20 from Sorrento). Your guide will meet You by the entrance of “Porta Marina Superiore”, (near the Pompeii – Villa dei Misteri Circumvesuviana train station). 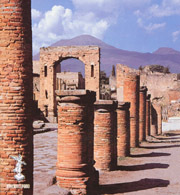 The visit of Pompeii ruins begins from the Forum and its majestic temples. It continues all along the main street flanked by different kind of shops, the area of the theatres, patrician dwellings such Domus Ceii embellished with wall-paintings and mosaic floors. We walk along Via dell’Abbondanza and we visit of the area of the amphitheatre. We get back to the Stabian Thermal Baths as well the striking plaster-casts of human bodies, victims of the tragic eruption of the 79 A.D, to the Lupanare Brothel. 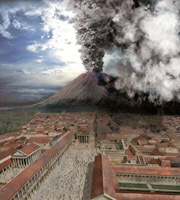 We’ll have the chance to take a glance at a typical Bakery of Pompeii. After the visit of The house of the Hunting - we have spent already roughly 3 hours of visit - we can have a lunch break to the unique bar of the ruins- lunch is not included. After a little rest we can complete the other 2 hours of guided tour: the House of the Faun, Vetti’s House, the House of the small fountain, the House of the big fountain. The Northern part of the Forum will be covered after lunch: the Forum, the Palace of Justice, the Curia, the Food Market, etc. To conclude this in-depth archeological visit, we’ll reach on foot the famous Villa of the Misteries. THIS FULL DAY EXCURSION	IN POMPEII RUINS COSTS EUROS 380.